Comodo Antivirus documents the results of all actions performed by it in extensive but easy to understand reports. A detailed scan report contains statistics of all scanned objects, settings used for each task and the history of actions performed on each individual file. Reports are also generated during real-time protection, and after updating the antivirus database and application modules. 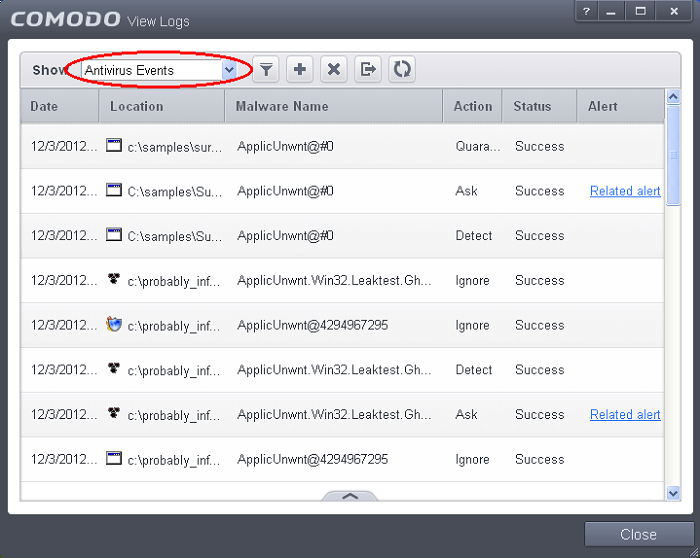 The Antivirus logs can be viewed by selecting 'Antivirus Events' from the Show drop-down of the log viewer interface. Alternatively, the Antivirus log screen can be accessed by clicking the number beside 'Detected Threats' in the Advanced View of the Home screen in the Antivirus pane. Date - Indicates the date of the event. Location - Indicates the location where the application detected with a threat is stored. Malware Name - Name of the malware event that has been detected. Action - Indicates action taken against the malware through Antivirus. Status - Gives the status of the action taken. It can be either 'Success' or 'Fail'. Alert – Gives the details of the alert displayed for the event. To export the Antivirus logs as a HTML file click the 'Export' button . To open a stored CIS log file, click the 'Open' button . To refresh the Antivirus logs, click the 'Refresh' button . To clear the Antivirus logs click the 'Clear' button .